When I do my Christmas crafting, sometimes I know exactly what to make someone and other times it takes a sudden hit of inspiration to get there. 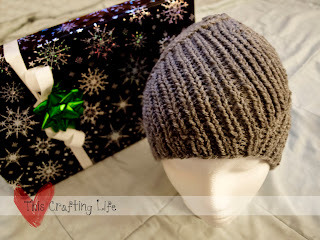 Last summer when I went to Stitches Midwest, I picked up a pattern for The Vortex Hat from the Halos of Hope booth. You can download the pattern free on Ravelry. I didn't do anything with it at the time, just added it to my "someday-to-try" pattern pile. When I needed some inspiration for the holidays, I flipped through it and saw this hat. Instantly I knew it would be perfect for my brother in law. I had a great shade of grey, so I went straight to work. Let me just say, this hat works up super fast! I've only ever knitted up a handful of hats (I usually crochet them) but this hat was very easy to do and a delight to see the pattern show up before your eyes! I was able to finish this hat in just a couple short hours of knitting and the results were great! It's a nice stretchy hat, and fit every head that I put into it. This will definitely be a hat I do again!